The recipe was revised from the original found in an All You Magazine because I did not have lemons or lemon juice on hand. I improvised with lemon extract, orange zest and orange juice and they turned out great. 1-2 tbsp lemon or orange juice(add 1 tbsp and stir. Consistency should be thick, yet runny. Cream butter and sugar in a large mixing bowl until light and fluffy. Beat in eggs and vanilla, lemon extract and lemon or orange juice. In a small bowl, combine flour, baking soda, baking powder, and salt. Slowly add flour to creamed mixture and mix until combined well. Drop by rounded teaspoons onto parchment lined ungreased cookie sheet. Space them out since they spread. Bake 7-10 minutes or until edges are lightly golden. Cool for one minute on baking sheet before removing to cookie rack. Allow cookies to cool before drizzling with frosting. 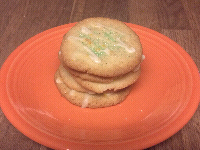 Combine frosting ingredients; place into a * decorator icing bag and drizzle cookies with frosting in a zig-zag fashion. *Use a plastic food storage bag to pipe frosting on cookies for easy cleanup.